♥ FABRIC: Each collar is made with 100% cotton designer fabric. I offer a wide variety of styles to make your pup the talk of the block! ♥ HARDWARE: All hardware is heavy duty. D-rings are welded for strength and durability. ♥ BUCKLES: Collars come with a standard black buckle however each collar can be customized with a colored buckle! Choose from several different colors to make your collar truly unique! ♥ CORE: Each collar is lined with high quality webbing. Interfacing is fused onto the "wrong" side of the fabric to add another layer of strength. Both webbing and interfacing are used to make sure your collar is the highest quality. Need a custom size? All collars can be customized! 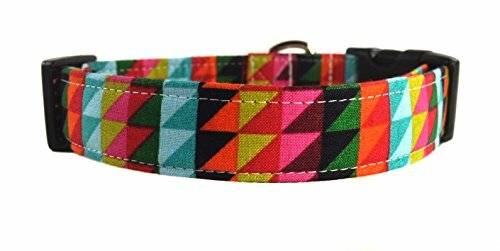 If you need a different size/width combo or if your pup is in between sizes, send me a message and I will create a collar that is the perfect fit for your pup. Tiny (3/8" width) 7" - 11"
X-Small (1/2" or 5/8" width) 8" - 12"
Small (3/4" width) 9" - 13"
Medium (3/4" or 1" width) 12" - 19"
Large (1" width) 15" - 24"
X-Large (1" width) 17" - 28"
If you have any questions about this product by Collars by Design, contact us by completing and submitting the form below. If you are looking for a specif part number, please include it with your message.